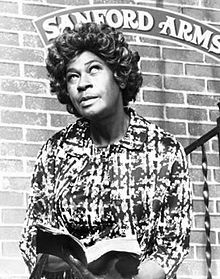 LaWanda Page (October 19, 1920 – September 14, 2002), born Alberta Peal, was an American actress and comedienne best known for her role as Aunt Esther in the 1970s TV sitcom Sanford and Son. She later reprised the role in Sanford Arms and Sanford. She was born on October 19, 1920 in Cleveland, Ohio. Page was raised in St. Louis, Missouri. LaWanda Page and Redd Foxx were very close friends from the time they were pre-teens. They attended school and grew up together in St. Louis. Later on, they both entered the field of comedy separately and performed stage acts. Page later recorded several live comedy albums for the Laff Records label in the late 1960s and early 1970s under the LaWanda stage name. One release, a gold-selling album called Watch It, Sucker!, was titled after one of her Aunt Esther character's catchphrases to capitalize on her newfound TV fame. During her tenure as a stand-up comic, which lasted all the way to the 1990s, she was often called The Queen of Comedy, or The Black Queen of Comedy. Other than the expletive-free Sane Advice album, released two years after the run of Sanford and Son, most of Page's albums and stand-up material were raunchy in nature. In 1977 Page appeared in an episode of The Love Boat, Martin, 227, Family Matters, and Diff'rent Strokes. She appeared on Circus Of The Stars as a fire eater. Page died of complications from diabetes on September 14, 2002. She is interred in an outdoor crypt at Inglewood Park Cemetery in Inglewood, California. Her daughter, the evangelist Clara Estella Roberta Johnson, died on June 4, 2006, in Los Angeles, California, at the age of 69. This page was last changed on 31 August 2017, at 06:01.